Set in the idyllic countryside on the Lincolnshire Leicestershire border, the Tollemache Arms is an attractive stone built 19th century country pub in the beautiful village of Buckminster located between Colsterworth and Melton Mowbray on the B676 just 4 miles from the A1. Within easy reach of the market towns of Stamford, Melton Mowbray and Grantham, the picturesque countryside of the Vale of Belvoir and England’s smallest county Rutland, the Tollemache Arms provides an ideal base to explore the local area with country houses, fishing, walks, cycling routes and even a gliding club are nearby. Now under a new management team the Tollemache Arms offer a warm welcoming and relaxed family friendly experience. Choose from our traditional pub classics, sandwiches and bar snacks served in the cosy surroundings of our bar to an a la carte dining experience in our main restaurant. Both serve freshly prepared food using locally sourced seasonal produce prepared daily by our Chefs. The Tollemache Arms has a large garden with plenty of space for al fresco dining and can cater for private parties, group parties, buffets, birthdays, anniversaries, weddings, christenings or any other events, either within the main building or in a marquee outside in the garden with bespoke menus to suit the occasion. The Tollemache Arms is situated 4 miles off the A1, between Colsterworth and Melton Mowbray on the B676, in the beautiful village of Buckminster. Buckminster has a tree-lined main street and lies just half-a-mile from the Lincolnshire border. The Church of St John the Baptist acts as a landmark, visible, high on the Leicestershire Wolds, for miles around. Locally there are shoots and Eventing at the Buckminster Park estate and great trout lake with day tickets available. For the more adventurous there is the Buckminster Gliding Club! Many properties in the local area and Grantham are owned by the Buckminster Estate, who are linked with the Tollemache family who live in Buckminster Park: the former home of the Earl of Dysart. They have connections with Helmingham Hall in Suffolk. Nearby is Nottingham, Melton Mowbray (well known for its world famous Pork Pies and Stilton Cheese), Grantham, Oakham, Leicester and Loughborough and are all conveniently situated within 20-mile radius of the village. The bar is open to everyone including children, dogs and their muddy feet and offers a relaxed family friendly atmosphere to enjoy a drink or sample the range of food on offer. In the bar you will find a comprehensive selection of draught beers, locally brewed guest ales and bottles beers to suit a variety of tastes. Home-made tasty nibbles such as mixed nuts, marinated olives, sundried tomatoes with feta cheese, bread platter with balsamic vinegar and oils and much more are prepared by the Chefs daily. For the larger appetite, classic pub food, sandwiches and salads are available daily together with freshly ground speciality coffee, including Americano, espresso, cappuccino, latte and mocha together with a range of teas to enjoy with your feet up or ‘to go’ if you are in a hurry. months or al fresco on our lawns during the summer months. Some peace and quiet while the kids are playing in the garden. Getting on your soapbox about today's events! The main restaurant offers a perfect venue to sample our range of a la carte dishes prepared daily by our Chefs using the best quality fresh produce and ingredients served by our friendly and attentive waiting staff. There are a variety of quality wines available that have been carefully selected with the philosophy to provide a diverse range of choice with emphasise being on quality and value for money. Indulge yourself in one of our delicious desserts made daily in our own kitchen for your enjoyment. To finish the dining experience there is an extensive range of specialised coffees including liqueur coffees together with a selection of cognacs and whiskeys and also an array of ports and dessert wines. Adjoining the main restaurant, the library was created to offer a separate relaxing area which has now become popular during the evenings for pre-dinner/party drinks and after-dinner coffees. The library, being a more intimate and quieter room, is ideal for small private venues such as private dining, business meetings, social gatherings, clubs and other similar functions where food, drinks and specialised coffees can be also be provided if required. The recently refurbished rooms all have new en-suite sanitary ware and underfloor heating, flat screen led smart televisions, tea/coffee making facilities, free high speed broadband and free off road parking. Photos and full pricing information are now on the website so please click on the "Room Rates" links for pricing details and on the "View Room Gallery" link for some interior photographs of the rooms and en-suite bathrooms. Full English breakfast or continental breakfast are available. Stay, dine, drink and fish packages will also be available shortly for exclusive trout fishing in the peaceful surroundings of the Buckminster Estate's own private parkland. Our menu's, prepared by our Head Chef are updated frequently and are always current - everything you see here on our site is what we're serving! Take a look over on the right for our latest menus - and remember we cater for children, for people with food allergies and any other special dietary requirements you may have. We really want you to enjoy the dining experience - not worry what you can and can't have! Our April 2019 menus are now on our website. Click on the link to the right for more details. Tuesday is our two for one special offer night. Order two meals from our special two for one menu and get the cheaper meal completely free! Wednesday is our special theme night. See our Special Events page for more details. Thursday is our weekly steak night. No frills just two 12oz chargrilled rump steaks, cooked how you like them, and a bottle of white or red house wine all for only £25.00. Thursday lunchtime from 12 to 3 is our discounted Pensioners' Lunch. Every special event deserves a special menu to compliment the occasion and take a look over to the right for the menus for all our up and coming events. From Valentine’s Night to Mother’s Day, from Christmas to New Year’s Eve, we have a special menu to mark the occasion with festive food and drink to push the palate. We shall also be promoting special offers during the week including two for one Tuesday where two can eat for the price of a single meal, a theme night every Wednesday and a steak night on Thursdays. Please refer to the Menu page for further details. Our next theme night is on Wednesday 17th April 2019 and is Italian Night. Click on the link to the right for details. For the little ones, our annual Easter Sunday egg hunt will be held in our grounds starting around 3pm. 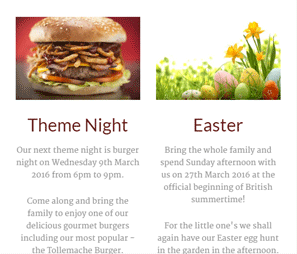 Should you be interested in the Tollemache Arms hosting your special event, be it large or small, please contact one of the team by telephone or email. Click here to see the full Desktop version. We're open on Bank Holiday Monday's - usual Sunday hours apply.